Gobble, gobble. Happy Thanksgiving! Make the pumpkin pie and turkey even tastier by sinking your teeth into a few Thanksgiving riddles. Thanksgiving is a time where family gathers, eats, plays games and often annoys one another. Thanksgiving can sometimes be a stressful holiday, especially for those who have to prepare and host the meal. Many associate the day with a family dialogue that often intensifies into a full-fledged yelling competition. But Thanksgiving should be about gratitude, togetherness and relaxation. These riddles for Thanksgiving will allow you to share some thought-provoking, cute, and humorous riddles, which is a great way to break the ice or ease tension. Research shows that religion, politics, climate change and other family drama should be avoided like the plague on Thanksgiving day. So instead make it a new tradition to tell Thanksgiving riddles at the Thanksgiving table. Make laugh not war! 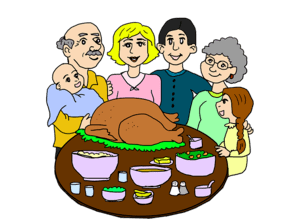 Here you will find 3 sections: 1) a general collection of Thanksgiving riddles, 2) Thanksgiving riddles for adults and 3) Thanksgiving riddles for kids. If roses are red, violets are blue, what is stuffed, brown and blue? I can be hot or cold, I can be made with fruit, vegetable or meat but either way you see it, on a Thanksgiving table I will be a treat. What am I? You see this festive event along the street on this special day, from Felix to Mickey to Dora and Bugs Bunny, all people will make way. What is it? I have ears but I cannot hear and I have flakes but I have no hair. What am I? What do the Pilgrims, Indians and Puritans have in common? How did the chicken, the pheasant, turkey, duck and goose get in trouble? What can never be eaten at Thanksgiving dinner? What do grateful, thankful, wonderful and joyful have all in common? The holidays are here! Check out our jolly Christmas riddles! Or warm up with some winter riddles. Can you tell which side of the turkey has more feathers? What is brown, big and red all over? How is it possible that a turkey can end up with 3 legs even though it has only 2 legs? What is the difference between a chicken and a turkey? If you’re carving the turkey with an electric cutter, what kind of battery does it need when it runs out of power? What has feathers and a beak but it is dressed? How can you tell which part of the turkey is the left side? I get stuffed and I get dressed on Thanksgiving. What am I? Can a turkey fly higher than an ostrich? When the Pilgrims walked off their boat into the new world, on what did they stand? What’s has feathers, a bowed head and kneels? What did the pumpkin say to the turkey on Thanksgiving? You’re lucky you’re only eaten on one holiday! This is my second one in a month! The holidays are all about stuffing yourself! So, check out these food riddles. Whether you’re the Thanksgiving host or not, be the one who everybody remembers as the “funny one that cracked me up” or the “thought-provoking one” on Thanksgiving day. Make this holiday full of fun and laughter with some of these hilarious and hard Thanksgiving riddles for adults. They go well with a traditional Thanksgiving family feast. Our adult riddles are sure to add a challenge and excitement to this holiday. We hope you enjoy these Thanksgiving jokes and riddles for adults. If you feel scared on Halloween, jolly on Christmas, how do feel on Thanksgiving? Pious and devout, I wear black and white clothes and funny hats. I am not a nun nor a priest, but I was an adventurer. Who am I? What is hard, oddly-shaped and brings you good fortune on Thanksgiving? If a tur-key has a key, and a don-key also has a key, what would you expect a monkey to have? Do you love riddles? Then you will love our riddles about love! How do you make a Pilgrim and turkey float? What has feathers, is wild and ready for a party? I am everywhere at Thanksgiving ready to be tried, I wanna get away but I got dressed and now I can’t fly. What am I? Why did the turkey got arrested and put into jail? What is that favorite sport of pumpkins and gourds? What do you get when you cross a turkey and a monkey? If it took 3 women 4 hours to roast a turkey, how long would it take 4 women to roast the same turkey? If four women can bake four pumpkin pies in four hours, how many pies can eight women bake in eight hours? Why did the turkey end up in the oven dressed and killed? How can you tell the difference between a male and female turkey? What is red and has feathers all over? Need more? Find more at our largest collection of riddles for adults. Engage your kids at Thanksgiving dinner with this collection of cute and funny Thanksgiving riddles for kids. It can be a challenge to keep children entertained, but kids love riddles! So this holiday season, challenge the little ones and let them show off what they know about Thanksgiving and turkeys. Enjoy these Thanksgiving day riddles for children. I can be a sweet potato or an apple, I can be warm or cold, but one thing is for sure I am delicious and loved by so many. What am I? If the turkey says gobble, gobble, gobble, and a peach says cobbler, cobbler, cobbler, what would a computer say? Which of the following does not belong at the Thanksgiving table: sweet potato, apples, carrots or onions? We came over in the Mayflower, crossed the ocean on a ship using the power of the wind and were taught how to grow food by those who were there before us. Who are we? Need more kid-friendly riddles? Head over to our largest collection of riddles for kids. Thanksgiving is here, everyone grab a chair, for it’s time to eat a tasty bird who flies through the air. What bird is it? I am a 12 letter word, 2 compound words and people celebrate me in the fall. What am I? I am a key that can fly and gobble. What am I? What is big, stuffed and brown all over? What has feathers, is the star of a November feast and goes up and down? If an apple, pear and peach come from a tree, where do turkeys come from? I can be crushed, baked, carved and you can see me everywhere on Thanksgiving. What am I? What do you call it when it’s raining turkey and birds? What’s the favorite food of mathematicians for Thanksgiving? You made it to the bottom of the page? You rock! You may just have the mental acumen to tackle our short riddles. Or, wait…do you know what time it is? It’s time for some time riddles! →We hope that our Thanksgiving riddles will add some fun and laughter to your table this holiday season. We are here to save you! Whether you need to start a conversation, lighten the mood, fill an awkward silence or show off your riddles skills we’ve got you covered. 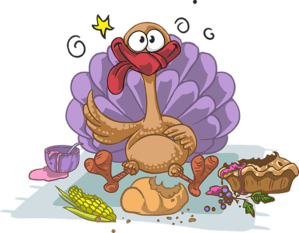 So fill your tummies with some yummy Thanksgiving food and your mind with some Thanksgiving riddles until your appetite for challenge and humor if stuffed. Please share these with others who appreciate a good holiday riddle.